Last time in this space we started discussing scenario planning by talking about preparing for the “big what ifs” or the driving forces that generally exhibit as 1) social dynamics, 2) economic issues, 3) political issues, or 4) technological issues. These are the cases that tend to push your thinking and are usually classified as the big unknowns. What if sales are flat this year or if sales decline by 20 or 30 percent? The nation’s leading luxury home building company, Toll Brothers, recently reported that sales declined 21% during second quarter with “hesitant customers remaining on the sidelines”. What if sales increase rapidly, such as 25 percent or more? One local tech company is growing faster than they can fill positions to meet customer demands. What if accounts receivable collections slow by an additional 30 days? Like a local manufacturer that experienced significant problems with his customers, making it very difficult to pay his suppliers. What if banks increase interest rates by several percentage points? Nevada has held one of the highest foreclosure rates in the nation over the past four months – 1 of every 232 households. This has a huge ripple effect for numerous industries. What if our biggest customer goes out of business or if we lose our biggest client? Most every business has a handful of key accounts that are critical to business success. What if we have a major public relations crisis such as a bad product or a lawsuit? These are crises that often come out of nowhere and could happen to any business or organization. Okay, so now that we’ve caught your attention maybe you’re ready to consider some “what ifs” of your own. Here are the steps for running your own scenario planning. One suggestion – this exercise need not be exhaustive. Begin by identifying the risks from the list of big “what-ifs” and smaller “what-ifs” and create a one-sheet for a few realistic, possible scenarios that your organization might face in the next few years. Define a timeframe for each scenario. Some events may occur in 20 years, some in two. But you can’t work with indefinite, open-ended scenarios. Establish the primary variable in your scenarios. Assess ways in which these variables may present opportunities or threats to your business. Clearly articulate the scenario with a problem statement. On a white board, write down “What if _____?” and fill in the blank. For example, “What if we lose our biggest client this year, resulting in a 50 percent decrease in revenue? Or what if new housing starts decrease this year by 20%? Flesh out the details of the scenario. Clarify exactly the situation your company would be in. when to execute the action plan by having a clear trigger point. Then detail the top five steps you will take in the effect the trigger occurs. These are designed to work regardless of how the future turns out. Many of these choices otherwise go unnoticed if you focus obsessively on your organization’s present-day situation. 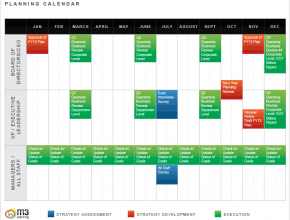 With scenario planning, you’re imagining not just one, but a variety of future possibilities. All the great opportunities in the world aren’t enough unless you have contingencies in place. And remember, you’re not only preparing for unexpected threats but also trying to foresee unanticipated opportunities.